What an opportunity to own this spectacular custom home with an extensive list of the finest finishes throughout and a wonderful in ground swimming pool and hot tub. 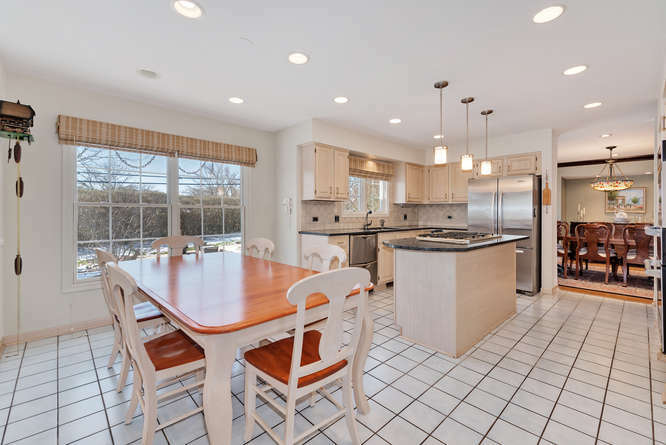 This open floor plan offers wonderful entertaining options with your gourmet Kitchen with high end stainless steel appliances, large island and granite countertops. 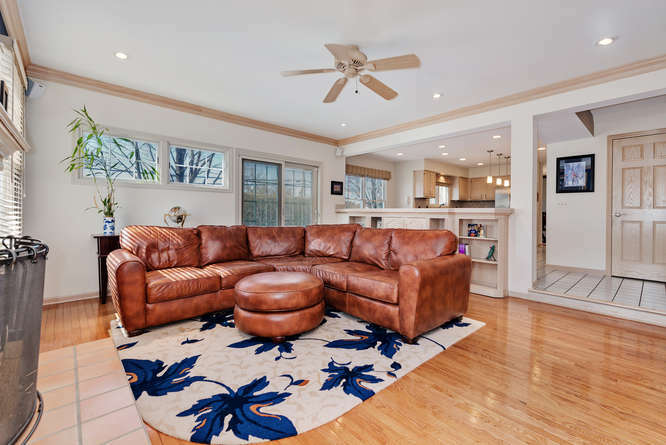 The large Family Room, Dining Room and Living Room all boast gleaming hardwood floors, crown molding, custom blinds and plenty of natural light. The main level also offers an impressive Office space with a 10ft ceiling and built in granite desk and custom floor to ceiling cabinets. The spectacular Master Suite has a vaulted ceiling, large sitting area, a walk in closet and the Master Bathroom you have always dreamed of, with amazing custom tile work, a double vanity with granite countertops and custom cabinets. 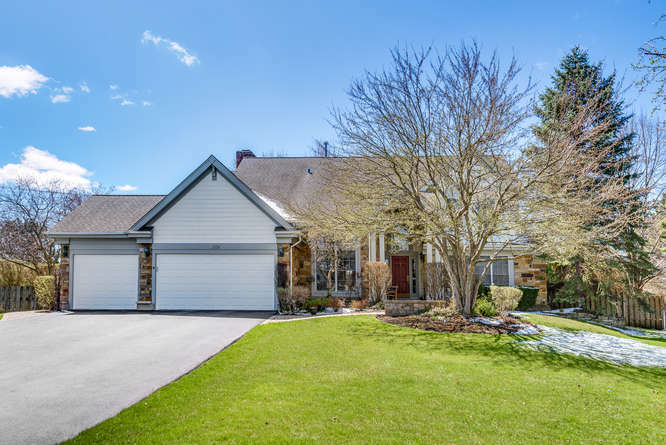 The large finished basement offers a Kitchen, bedroom, full bathroom, lots of space and a large store room. All this AND District 96 and Stevenson High School! 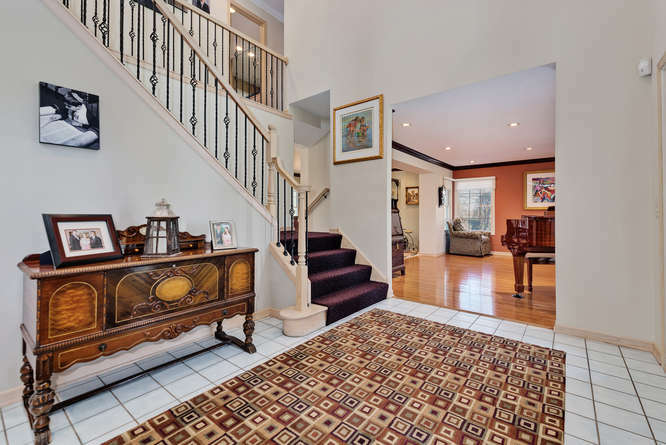 This dramatic two-story entryway features ceramic tile floors, crown molding and custom bannister with wrought iron spindles. As you enter the home you can feel the openness with access to the upstairs, Living Room, Office and Kitchen. Just a step down off the Kitchen, this comfortable room features hardwood floors, crown molding, an abundance of built in cabinets and shelves, a ceiling fan and a sliding glass door to your backyard. You can see the fireplace with tumbled marble facing and customized blinds. This versatile room also includes surround sound speakers. This exceptionally bright gourmet kitchen will be a delight with its ceramic tile floor, large island with granite countertops and high end stainless steel appliances. Your special events are made easy with the adjacent Dining Room. 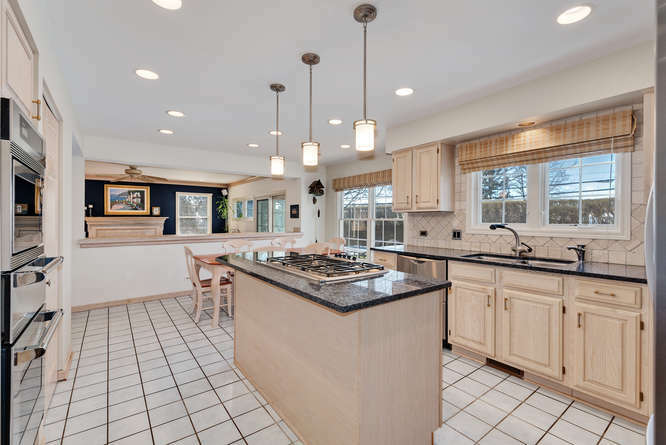 You can see the two large pantries, the Thermador oven with warming drawer, microwave and Thermador five burner cook top on the large island. Large eating area provides plenty of room for small or large gatherings. 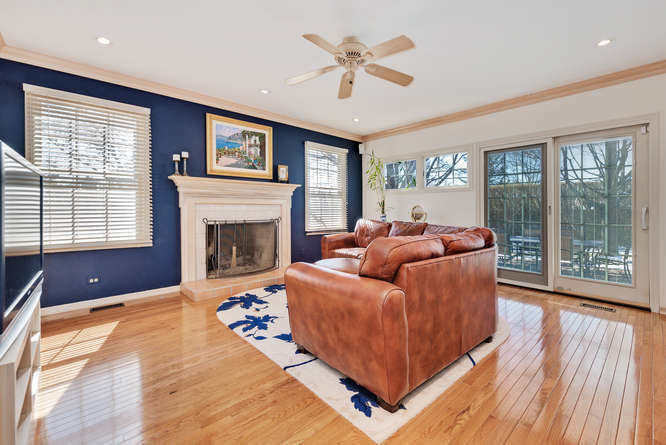 The lovely Living Room also has hardwood floors, custom blinds and crown molding. 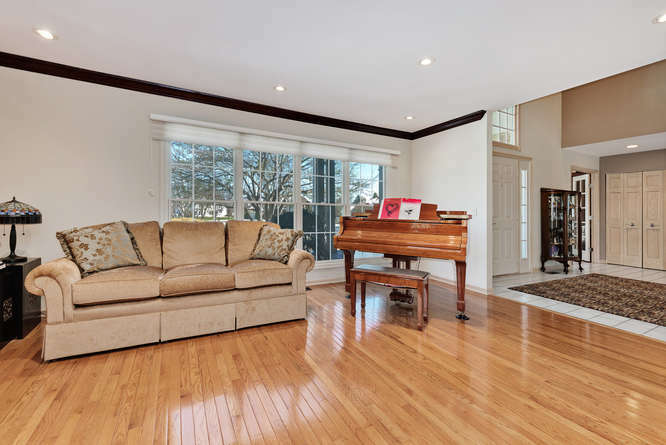 As you can, this room is large enough for a piano with plenty of space for relaxing and entertaining with your friends and family. 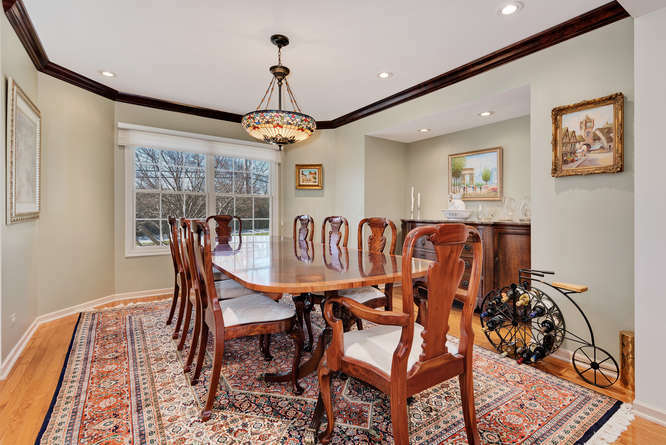 Your elegant Dining Room features gleaming hardwood floors, custom blinds, a large “bump out” for your China cabinet, crown molding and a tiffany style chandelier. 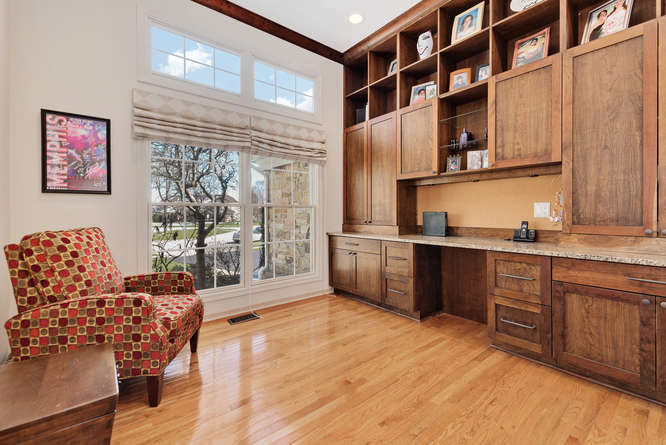 The private Office offers 10 foot ceilings, hardwood floors, crown molding, custom draperies, a ceiling fan, french doors and a built in granite desk with floor to ceiling custom wood cabinets. This impressive Master Suite with sitting area will easily become your oasis. Enter through French doors into this incredible space, you will find a walk in closet, vaulted ceiling, ceiling fan, custom blinds and window treatments. Here’s the master bath that all of your friends will envy! 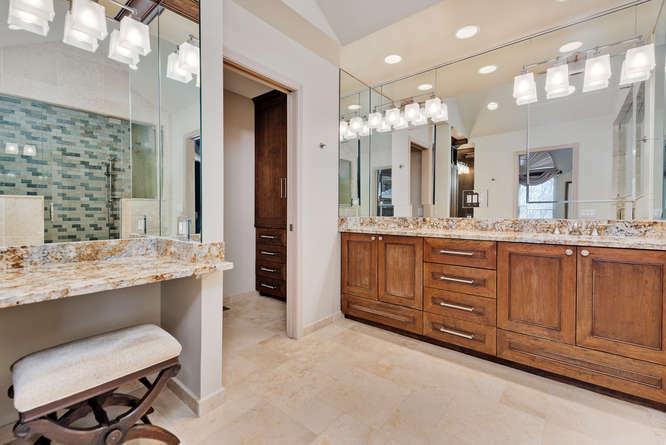 Vaulted ceiling, custom marble floor, incredible double vanity with custom cabinets and granite counter, separate make up area with even more granite countertops! 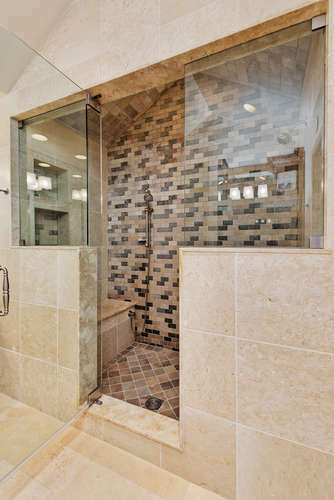 This incredible shower features remarkable tile work, a seating area and ledge, and double faucets. You will have to see this in person to truly appreciate its quality! Large second bedroom features carpeting, custom blinds, a ceiling fan and a large closet. 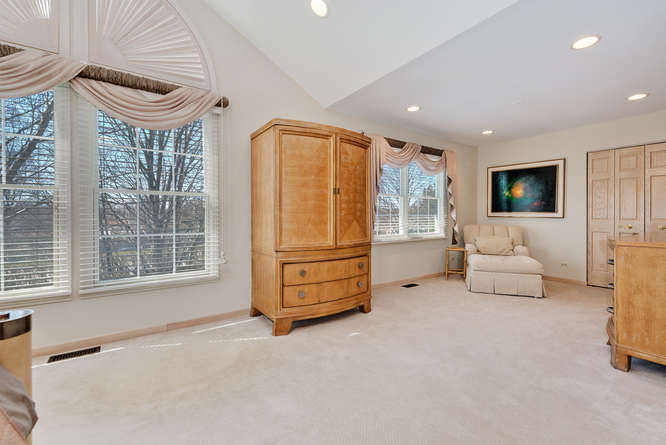 Another large bedroom, this room features gleaming hardwood floors, crown molding and customized built in corner shelves, custom blinds, a ceiling fan and two large closets. 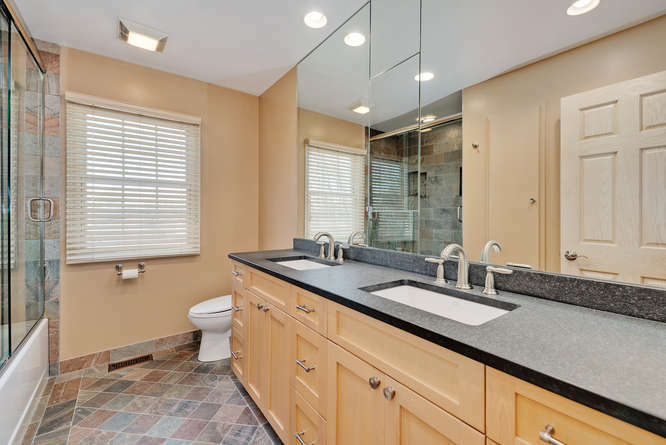 The second full bathroom offers custom slate tile floors, a double vanity with black granite countertops, a custom shower and tub with two shower boxes and handheld shower faucet. 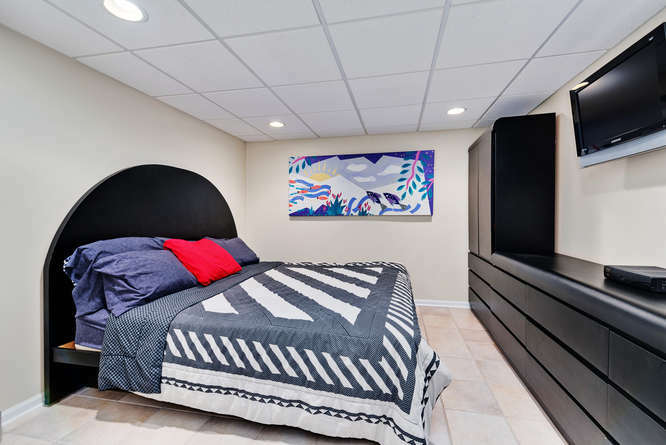 This large bedroom in the basement provides for the ultimate privacy for your short term or longer term guests, with high end full bathroom. 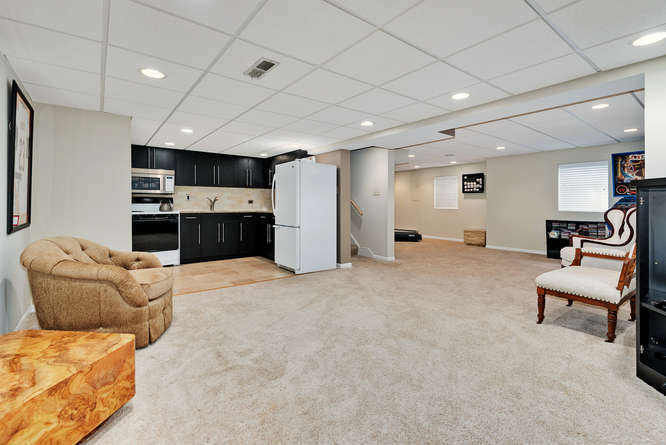 The incredible finished basement provides a full kitchen area (9 x 7) with a refrigerator, oven and stove and microwave. 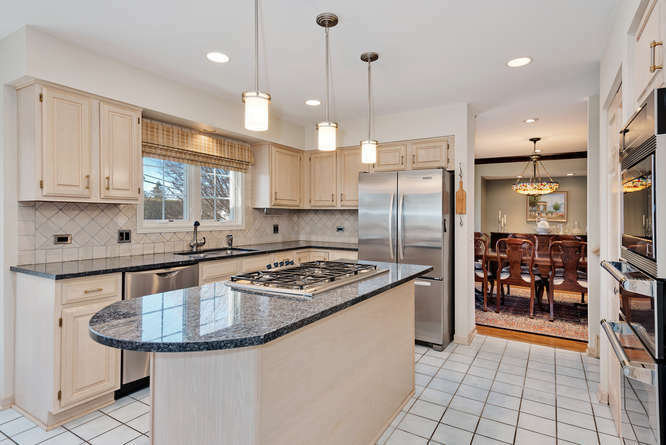 The kitchen is appointed with ceramic tile floor, granite countertops and wood cabinets. Beautiful plush carpeting, drop ceiling with built in speakers. 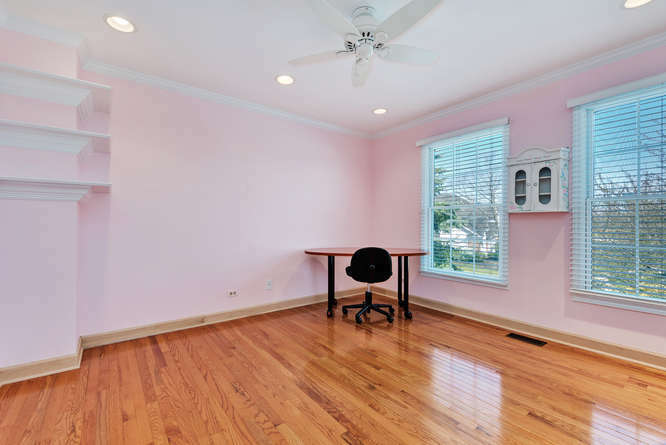 Plenty of room for the kids to play of for an exercise room. 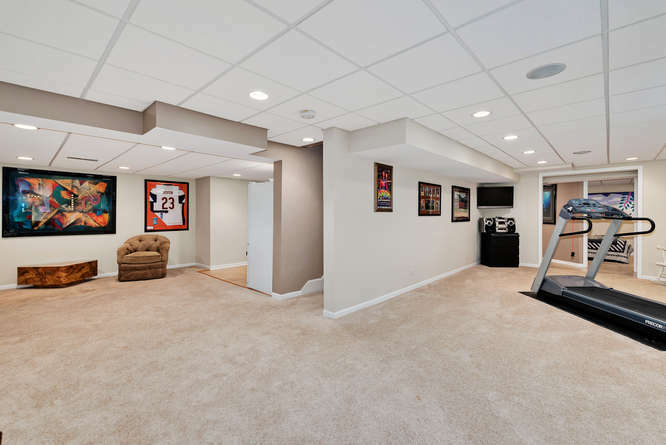 The Basement also offers a very large storage area. You will have the best Summers in this home! 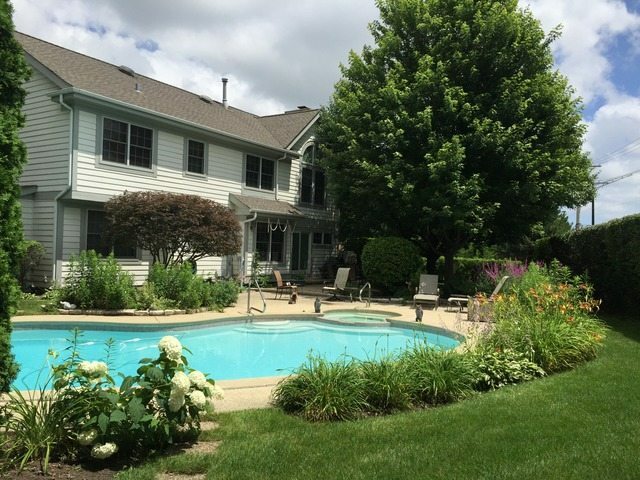 Large in ground swimming pool with hot tub! 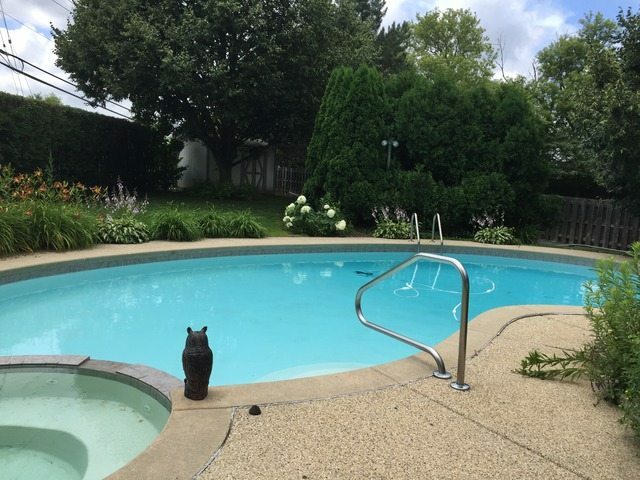 This awesome yard is professionally landscaped and has a large shed for storage. What a rare opportunity to own a home with so many entertaining options! 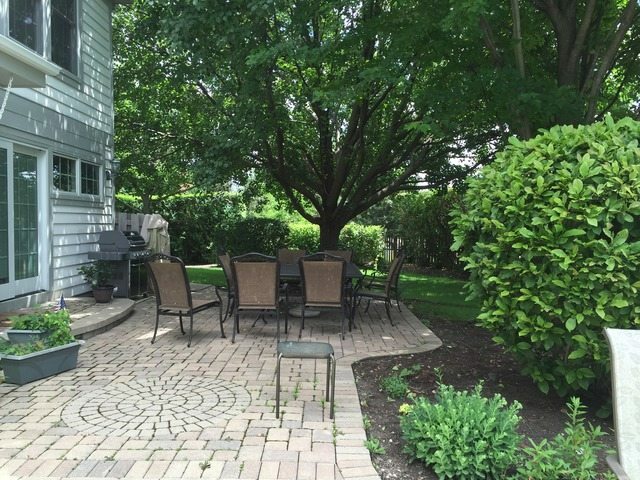 Custom paver patio is large and you can host awesome BBQ’s for your swimming guest.